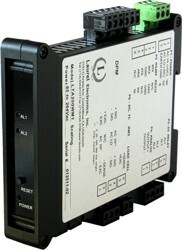 The Laureate 4-20 mA and RS232/RS485 transmitter for frequency, rate or period accepts two independently scalable input channels from a wide range of pulse sources, such as NPN or PNP proximity switches, contact closures, digital logic, magnetic pickups down to 12 mV, or AC voltages to 250 Vac. Input frequencies can range from 0.005 Hz to 1 MHz. Applications include AC line frequency, RPM or speed from proximity switch inputs, and flow from turbine flow meter inputs. Laureate frequency meters and transmitters can sense low-level signals from magnetic pickups or the NPN or PNP transistor output of active sensors. These can be powered directly by the meter or transmitter. Output in RPM or units of speed is achieved by mathematical scaling.